MilTec (UK) Ltd will use the PLASA Focus show to unveil their new British made speakers to the UK entertainment industry. The Blakite and Blakite TR ranges signal the beginning of a new era for the company. David Faulkes, sales director commented: “We didn’t want to spend any more money shipping boxes filled with air from China to the UK and decided to spend it on components and materials from the UK and Europe instead. 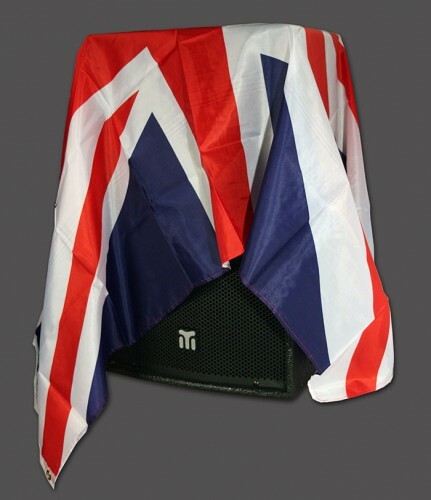 Designed at MilTec’s HQ near Maidstone, Kent the new speakers will be built in the UK and will replace the highly successful TP range which has been a standard fixture in clubs, bars, schools and rental companies for the past three years. The mid/top speakers are available in black and white and will all include pole fittings, flying points, bracket adaptors, rubber feet and a 35 degree rear slope for use as stage monitors. The subs are all bass reflex with pole adaptors and rubber foot recesses. Larger models will also have wheel options. The new range will show a significant increase in durability, sound quality, frequency range and efficiency. A new concept in speaker design will also be launched at the show. The TP62 is fitted with 2x 6” drivers and a 1.7” compression driver. Interchangeable horn flares allow use as either a single source or a mini line array speaker. The optional flying hardware is designed to stack the speakers on top of a sub to create a large single source or allows them to be flown as a mini line array with up to 8 cabinets per side. A compact stage wedge fitted with concentric drivers will also be included in the range. All of these products plus lightweight amplifiers and signal processing products will be shown on stand C7 in the New Dock Hall.